The NASA Dawn spacecraft has been approaching the dwarf planet Ceres, and for once we have an ongoing mystery that nobody can figure out. All of these photos are courtesy of NASA/JPL-Caltech. The shots on this page were taken from about 4,500 miles (7,200 km), which is pretty close given that there is no atmosphere to obstruct vision. 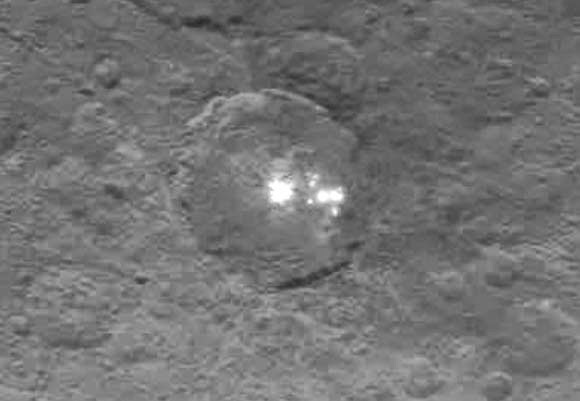 There are two bright spots inside a huge crater on Ceres that could be, well, just about anything. The likeliest guesses are that they are salt or ice. However, there are problems with both of those hypotheses. It appears that something was discharged from the planet from under its surface soil. The spots appear to be elevated above the surface, and that makes no sense at all. But ultimately it will make perfect, boring sense. Having been through this numerous times, the issue ultimately will be resolved as some kind of rock or mineral or ice - the 'usual suspects.' You know it's coming, everyone wants to believe in Aliens but there is absolutely zero chance that that is what NASA will determine them to be from. 'They' always explain away these anomalies as simple geologic curiosities, and they know what they're talking about. My hunch is that it is some kind of ice from below the surface that at times becomes viewable and somehow achieves temporary stability on the surface. However, while it lasts, this is a fun - and picturesque - mystery that has captured the public's imagination and, truth be told, done NASA a 'world' of good in terms of generating interest in these touristy excursions through the Solar System that, let's face it, have no real tangible value to the common man and woman beyond the 'wow' factor. Dawn makes its closest approach on 6 June 2015, and if that doesn't resolve the issue, it won't be resolved for quite a long time. Incidentally, there is a similar anomaly elsewhere in the Solar System, which pretty much seals the issue in terms of the Ceres spots being some kind of natural phenomenon. The other one is at Wunda Crater on Uranus’ crater-blasted moon Umbriel. The 131-mile-wide crater, situated on the moon’s equator, is named for Wunda, a dark spirit in Aboriginal mythology. It is a bright feature about 6 miles (10 km) wide. 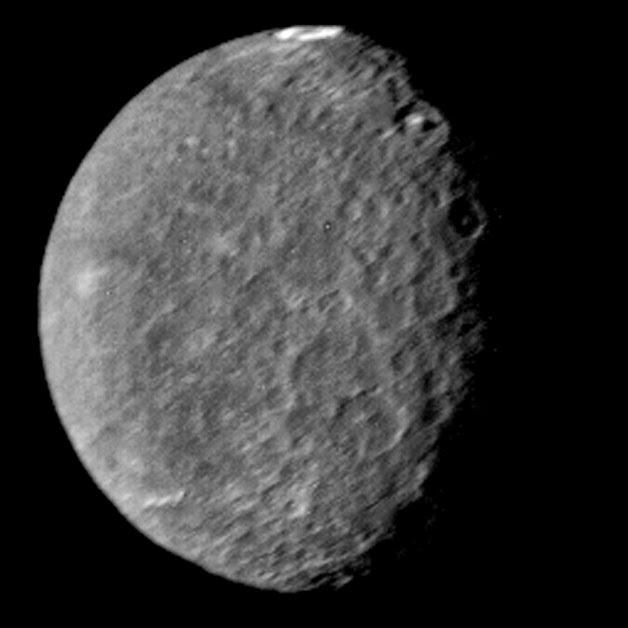 Umbriel, showing its white spot. Umbriel for some reason always reminds me of the Death Star. But, unfortunately for those looking for excitement, it's just a chunk of lifeless rock like everything else. Below is a computer-generated journey to Ceres.